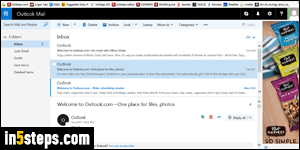 Like its predecessors (Hotmail and Outlook.com), Outlook Mail lets you show the reading pane on the right (default), move it to the bottom (so that the folder listing appears at the top), or hide it altogether (in which case you only see a message listing, and have to click on one of them to read its content). 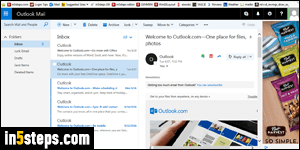 In that sense, Outlook Mail behaves just like any classic desktop email program! 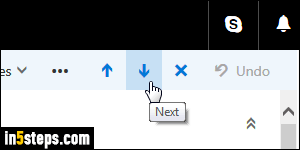 Once in your inbox, click on the gear icon in the top right corner of the page, and select your Display settings. It opens an options pane on the right. The last option, "Hide reading pane", is a good compromise if you're using a small screen resolution. Short of changing it (Windows / Mac OS X), that means that you'll have to open each message, one at a time. In email reading mode, you can hit the Ctrl+. keyboard shortcut (control key and period) to go to the next email, or to Ctrl+, (control key and comma) to load the previous one.